This is a small utility that I've created that allows you to download all of the current Windows critical updates. All updates are downloaded directly from microsoft.com to your computer with a single mouse click. I will be keeping this program up to date, adding features and removing bugs. Feedback is appreciated. You MUST have the .NET 2.0 Framework installed for this utility to function. Scroll up - see the Google bar? 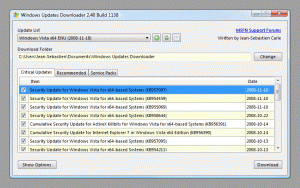 Windows Updates Downloader now comes with a new installer, complete with silent install switches for all you UA nuts! To install silently, you must use the /S switch (case sensitive!). You can customize the install using the following switches. Be warned though - when run silently, the installer does not check for the presence of the .NET Framework. Make sure that you have the .NET 2.0 Framework installed (version 2.0.50727 or higher) before running WUD.